Sarah Burnette is the director of public relations for the zoo and finally, there is me. In Morgan City we interviewed a man named Glen Fusilier. His testimony said that he had been fishing with his wife near one of the areas where the Tarzan film had been made. Near sunset he heard a terrible scream or cry from an animal that he had never heard before. 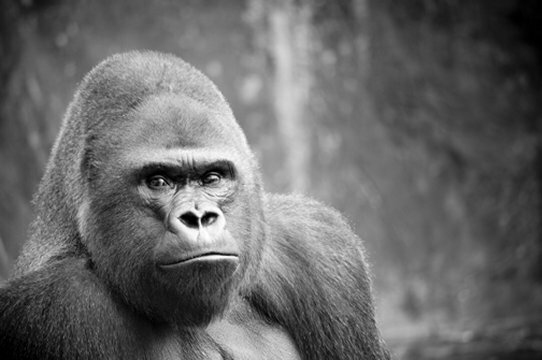 A year or so later, while enjoying the Audubon Zoo in New Orleans, he heard the same scream when he was walking through the vicinity of the primates. Months later, my wife Doris and I were in New Orleans. I was there to perform a wedding for a young couple we had known since they were children. On Sunday we met Allison and videotaped Jerry Dupree's interview in Algiers. 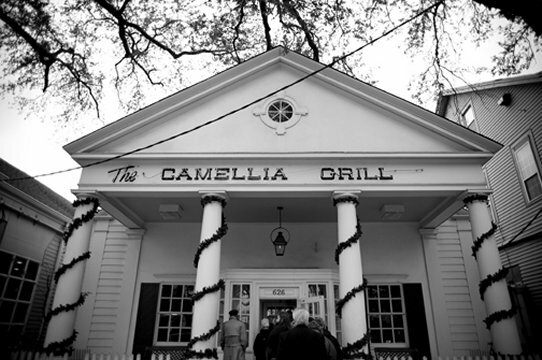 After lunch at the Camellia Grill on South Carrollton Avenue, we drove about a mile to the zoo. We were in hopes that since we didn’t have any sound equipment, that we could just go in and tape the monkeys and apes. Security was very nice and wanted to help but they said we needed to get clearance. Upon returning home, I emailed Sarah Burnette who is the Public Relations person at the zoo. I explained my project and she was very receptive and even set up an interview with Marsha Fernandez, the zoo primate expert, to share her knowledge. I always try to take advantage of capturing as much as possible on a trip. I live in the northwest corner of Louisiana and New Orleans is located in the southeast corner. No matter how many times I go there, I always get lost. I don’t know if you have ever been to the Big Easy, but it is one loosy-goosy city layout thanks to the snake-like Mississippi River. I also contacted the New Orleans Athletic Club which is where the gymnasts came from who joined with the circus acrobats in 1917 to wear the ape costumes in the Tarzan of the Apes film. I will deal with the club in another episode of stories-behind-the-story. On December 18, 2009, Allison and I arrived right on time at the zoo. Sarah came into the lobby to greet us and it was evident that she is a very kind and professional person. We picked up Marsha Fernandez and scouted the administration until we found the perfect room for the interview. It didn’t take but a moment of talking with Marsha Fernandez to see that she was going to be perfect for the interview. She knew all about apes and monkeys and truly cared about the animals. She was comfortable with valuable purposes of zoos in our culture. She laughed easily and kept her comments brief but complete. Needless to say, she had done interviews before. To be honest, I was a little fearful that she would begin the interview by denying the existence of apes or monkeys in Louisiana. But she didn’t. She told us of several calls that had come in for not only monkeys but other non-indigenous animals as well. She had heard of the stories of monkeys in the bayous and the legends of ape-like men in the jungle-swamp areas of Louisiana. I am not going to tell what she said. You will have to see our film, but I will share that she said that monkeys do not make good pets. They are cute and trainable when they are young because they see it as play. As they age and lose interest in play, they become mean and violent. Laws that govern the possession of wild animals are ambiguous and local. On one street, you might be breaking the law to own one and the next street over it is perfectly legal. The sad news is that people who possess apes generally acquired them from overseas or at flea market type places. Fearing the law, the owner is afraid to find out what to do with the apes/monkeys so the animals are too often put in cages and locked up in garages. Sometimes they are released into the wild. 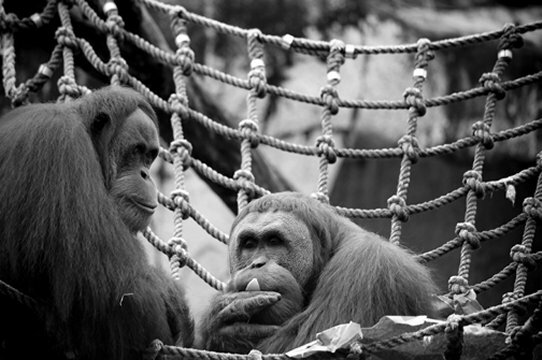 Many primates are social and will seek out humans. Monkeys and humans may be considered close in DNA, but not in immunities. A little human allergic reaction can be fatal to a primate and something they might carry could endanger one or more humans. Don't try to trap them. Instead, call on a professional to handle the situation. 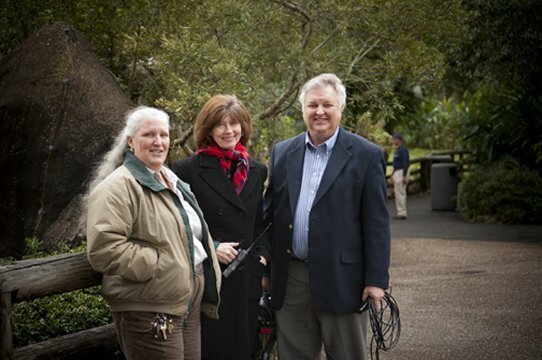 After the interview, we filmed around the primate area of the zoo what is known as "B" roll. You'll have to wait to see the monkeys in the documentary for obvious reasons, but here are some photos of gorillas and orangutans. 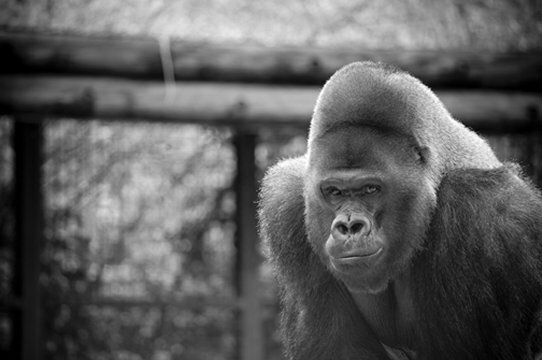 The silver back gorilla was a very commanding specimen. They refer to him as GQ because he poses for the cameras. All the apes knew Marsha Fernandez and even wanted to play "peep-pie." She had raised most of the apes from infants. 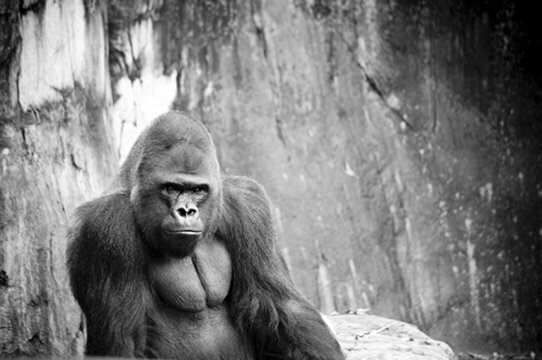 When we left the gorillas, the silverback barked. Marsha Fernandez said he liked blondes and didn't want Allison to leave. What is it with big apes and blondes? After lunch at Camellia Grill we headed to the Athletic Club to go through the archives. That is for another story on another day. This cafe is famous. Tbere is always a line that extends outside. There is a keeper at the door who lets one or two in at a time. Then you sit on little couches that line the back of the cafe. As people leave, the keeper motions for you to step up and sit down. It is a very entertaining place to dine. These three pictures are of GQ as he poses for Allison. Orangatangs are very fun to watch as they watch us.